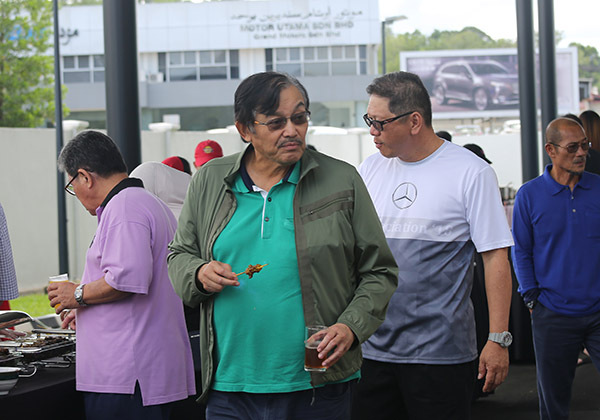 Yesterday was a yearly event held by Jati Transport Sdn Bhd which was the appreciation day for their customers and fans of Mercedes-Benz in Brunei Darussalam. 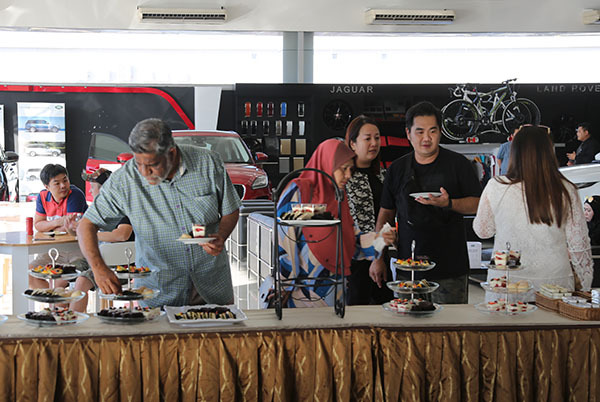 It was also a way of showing their appreciation to the customers in trusting their products and services offered by Jati Transport Sdn Bhd. 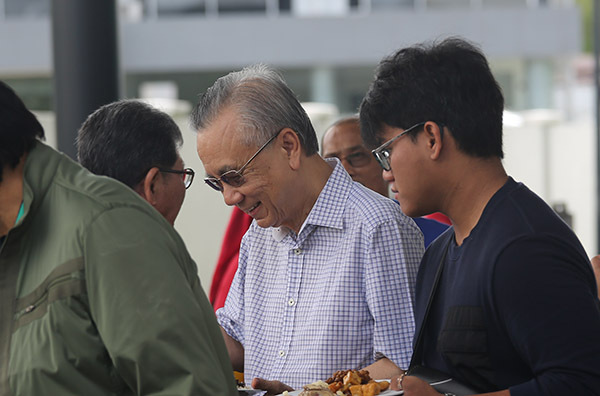 Also present were Pengiran Anak Haji Ja’afar ibni Al-Marhum Pengiran Pemancha Pengiran Anak Haji Mohamed Alam, the Executive Chairman of Jati Transport Sdn, Andrew Chiam, the Executive Director of Jati Transport Sdn Bhd, Alfred Soo, General Manager of Jati Transport and other management of Jati Transport Sdn Bhd. 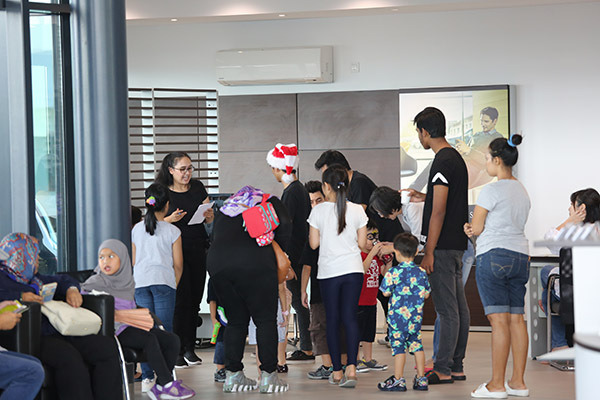 Hundreds dropped by Mercedes Autohaus at Beribi and they were treated to a wide variety of food and other activities such as statue dance, photo booth, dance workshop, face painting to name a few. 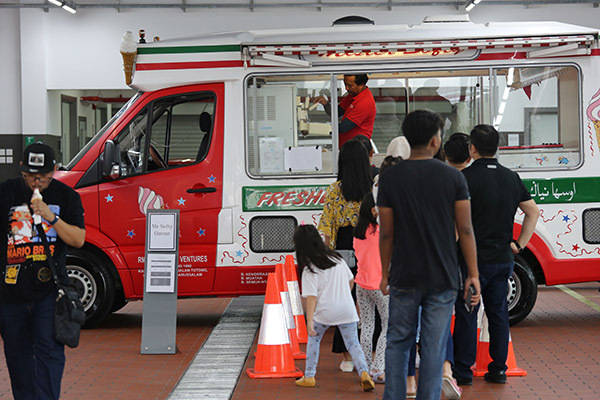 On the side note, Stephen Reid, Service Manager of Jati Transport Sdn Bhd, also made presentation on types to raise the awareness of safety. 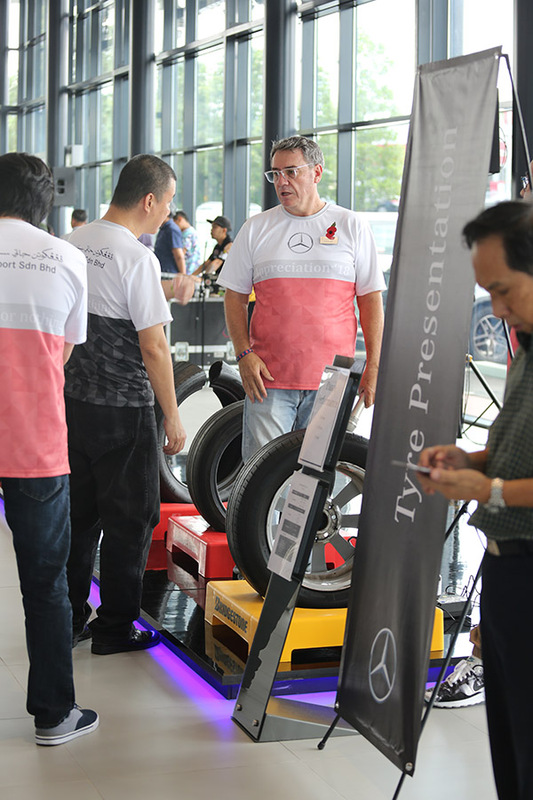 The Service Department of Jati Transport Sdn Bhd introduced the Mercedes-Benz Star Select. 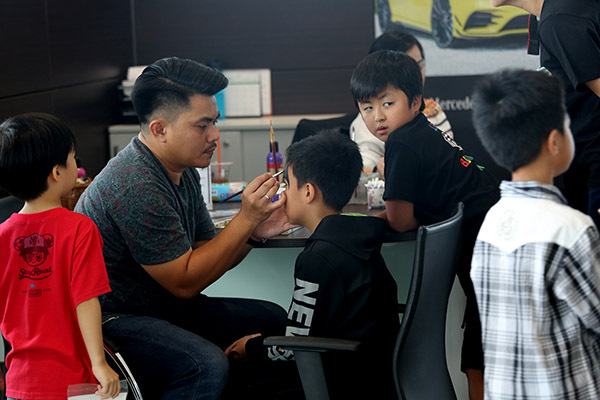 It is a maintenance program for Mercedes Benz models for five years and older with up to 35% off on services and repairs. 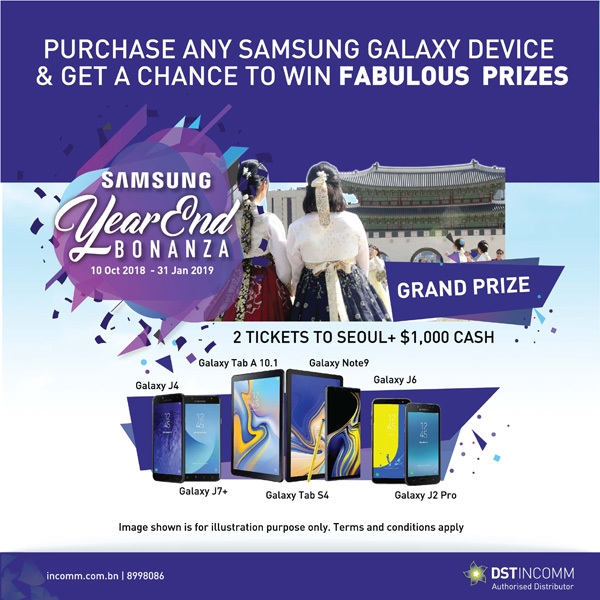 The offer will be valid until June 30, 2019. 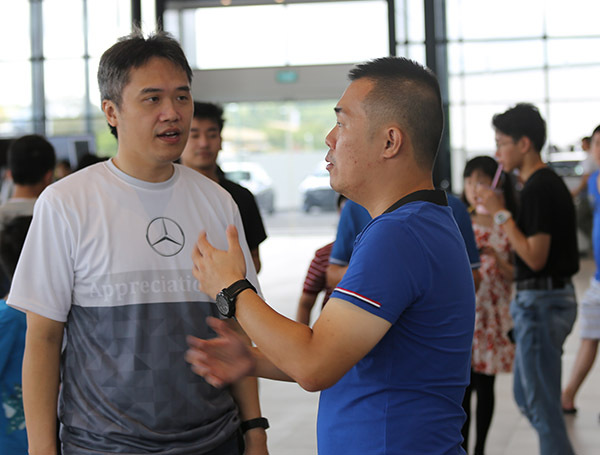 The event also saw customers test driving the available models of the Mercedes-Benz. 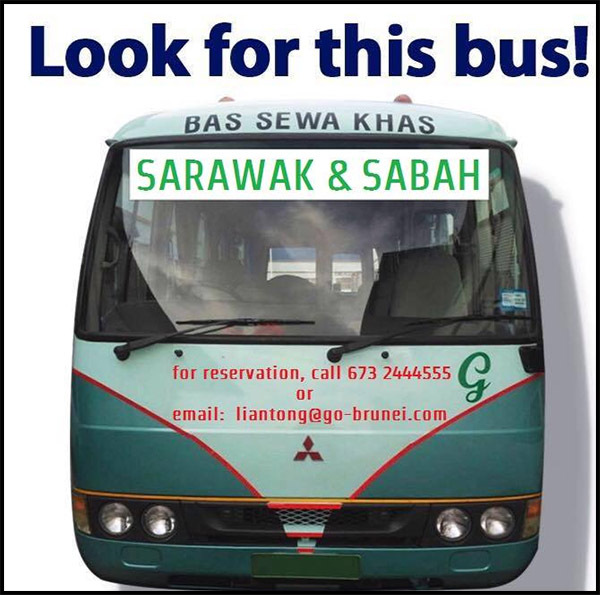 Effective 01 November 2018, Syarikat Lian Tong & Anak-Anak will be providing chartered bus services to Sarawak and Sabah. 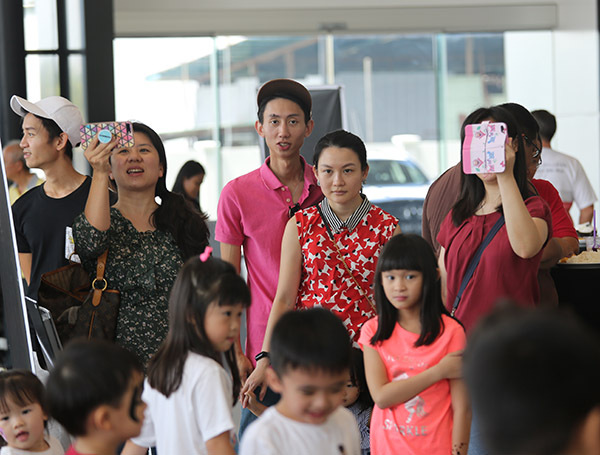 Need to travel via Miri Airport? 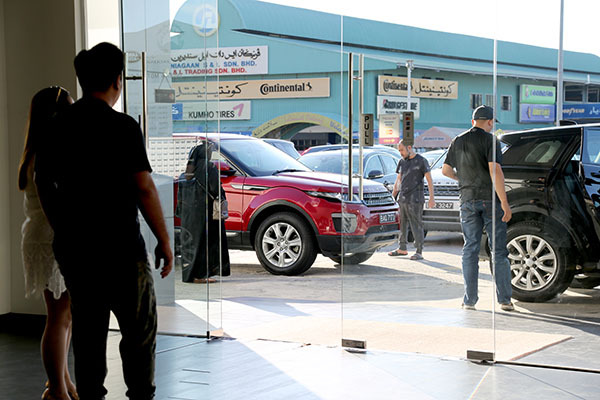 Shopping in Miri & Kota Kinabalu? Road Trip to Kota Kinabalu with stopover from Limbang to KK? The bus is equipped with 32″ LED TV and GPS Android System for their passengers ‘comfort. Call them now for booking at (673) 2444555 and early bird discounts applicable subject to terms and conditions. Baiduri Bank, in collaboration with Mastercard, has rolled out an amazing promotion for their Baiduri Mastercard cardholders. 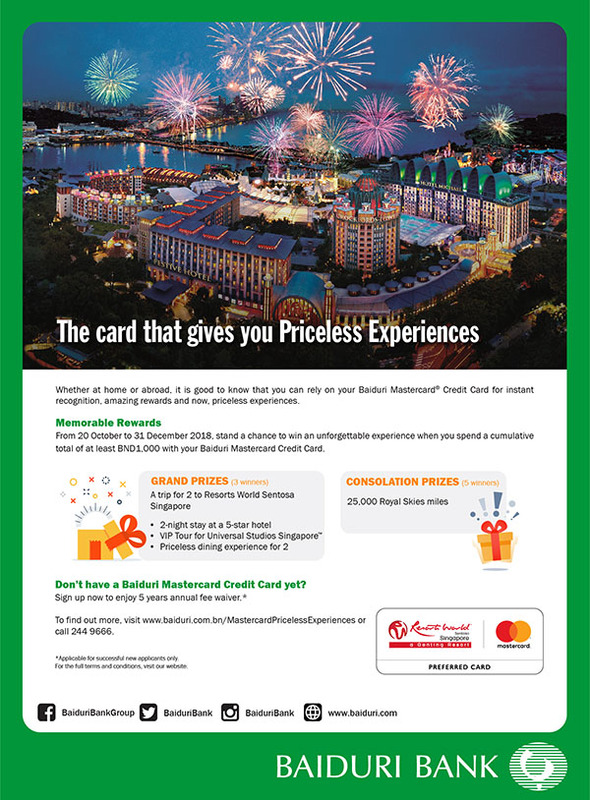 Between 20 October 2018 to 31 December 2018, Baiduri Mastercard cardholders stand a chance to win a trip for two to Resorts World Sentosa. 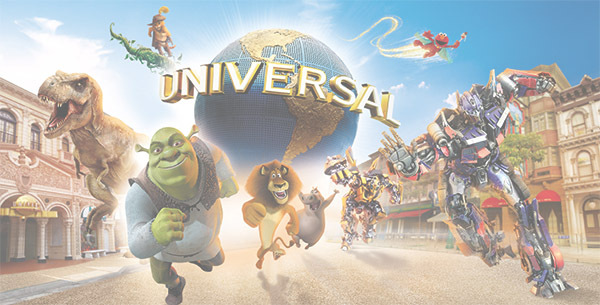 The package includes a 2-night stay at a 5-star hotel, a VIP tour of Universal Studios Singapore and a priceless dining experience for 2. 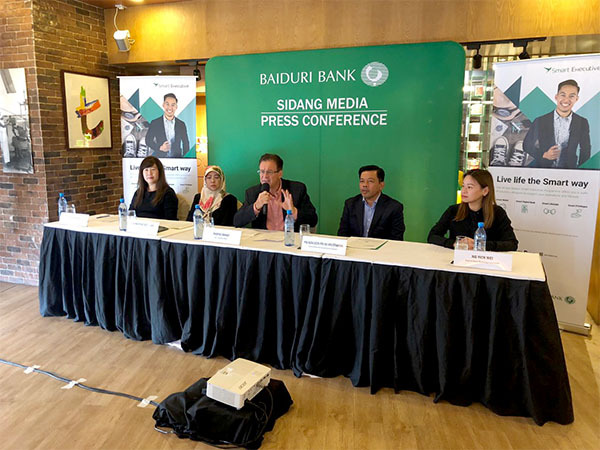 To be eligible, Baiduri Mastercard cardholders simply need to use their Baiduri Mastercard Credit Card to make their purchases during the promotion period. 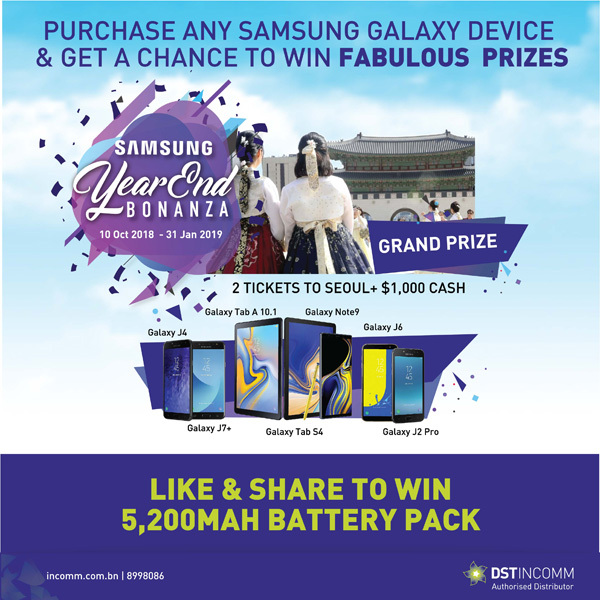 Cardholders who spend a cumulative amount of at least BND1,000, receive 1x lucky draw chance. Furthermore, successful new applicants of Baiduri Mastercard Credit Card will enjoy a 5-year annual fee waiver. Baiduri Mastercard Credit Cards comes with an array of benefits, such as exclusive rewards and offers, easy instalment plans as well as ability to accumulate Bonus Points for the Baiduri Instant Rewards programme. With every purchase, customers enjoy Bonus Points, which in turn gets converted into Baiduri Dollars stored in the Instant Rewards card for instant redemption at any Baiduri merchant. 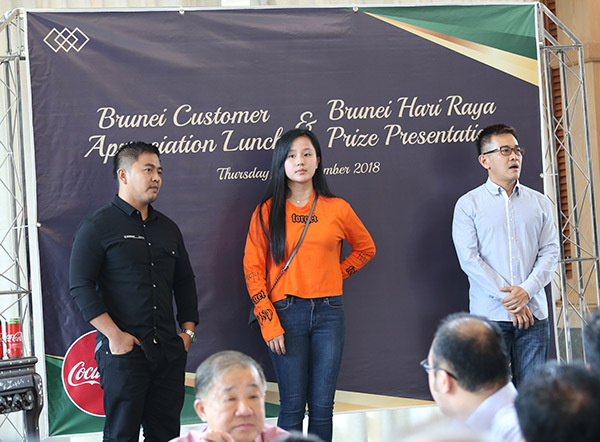 Recently, a prize presentation and customer appreciation lunch was held at Li Gong Restaurant for the Coca-Cola Raya Contest 2018. Present during the event were invited guests and contest winners. 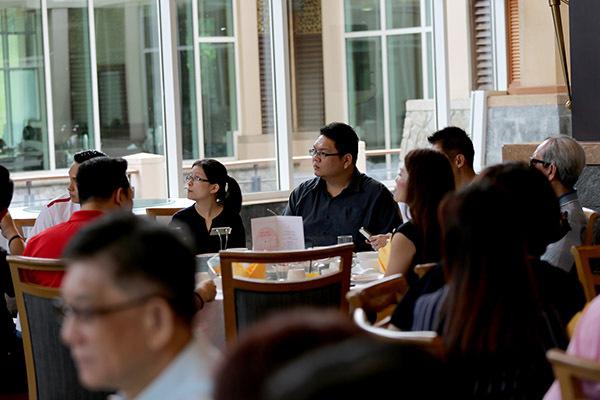 Commercial Planning Director, Ms. June Tay from Coca-Cola Refreshments Malaysia (CCRM) also shared a few words in regards to the event. 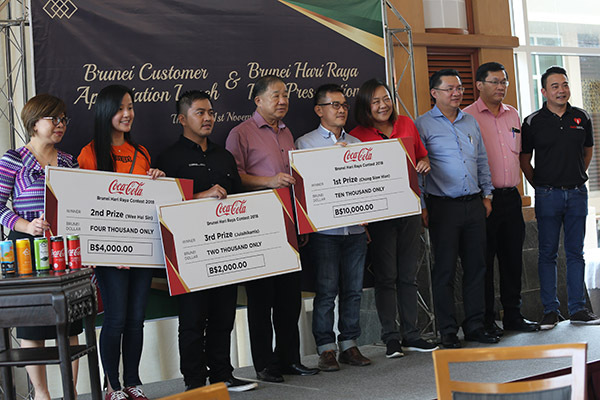 The recent contest was open to all Brunei residents where participants were required to purchase any 12 cans of the participating brands including Coca-cola, Sprite, Fanta, A&W, Heaven & Earth, Aquarius and Minute Maid. 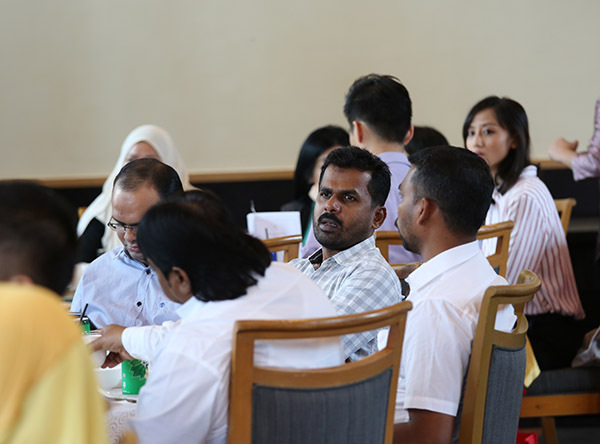 Participants were then required to register by sending a “HI COCO-COLA’ to a given contact number where they will then need to follow the instructions given to them. 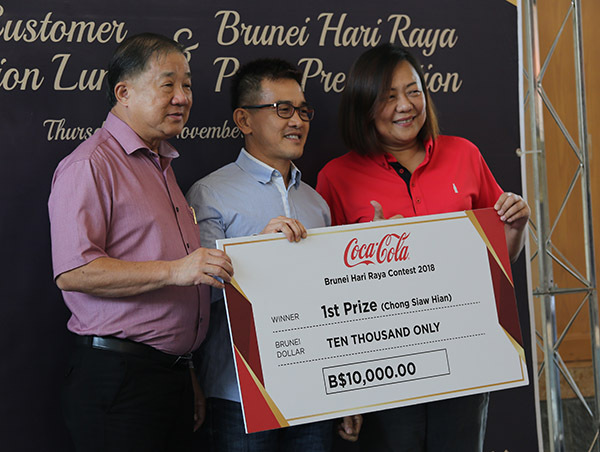 Winning the grand prize of the event was Chong Siaw Hian, who won a total amount of Ten Thousand Brunei Dollars (B$10,000.00) Cash Prize that was presented by CCRM Sales Director, Ms. Yap Wei Han and the Managing Director of Syarikat Perniagaan Malar Setia, Mr Lim Chin Lam. 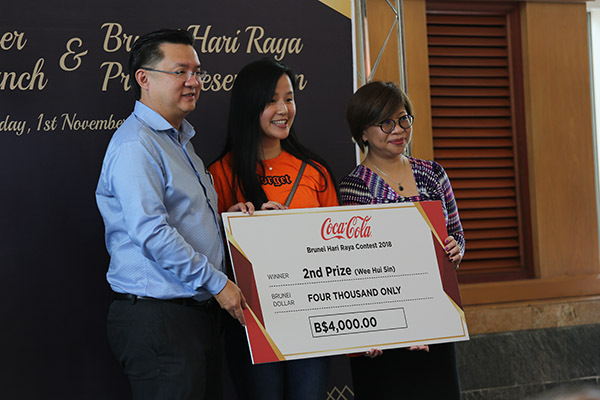 The second prize was presented by Ms. June Tay, Commercial Director from Coca-Cola Refreshments Malaysia, and Mr.Eric Lim, Sales Director from Syarikat Perniagaan Malar Setia, where a cash prize of Four Thousand Brunei Dollars (B$4,000.00) was won by Wee Hui Sin. 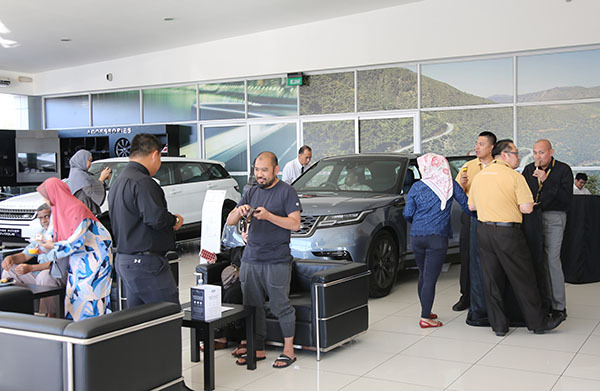 Lastly, the third prize was brought home by Julaihi Kamis with an amount of Two Thousand Brunei Dollars (B$2,000.00) presented by Mr. Melvin Loo Hun Hui, the Regional Sales Manager of Sarawak and Mr. CW Lim, Purchase and Logistic Director from Syarikat Perniagaan Malar Setia. 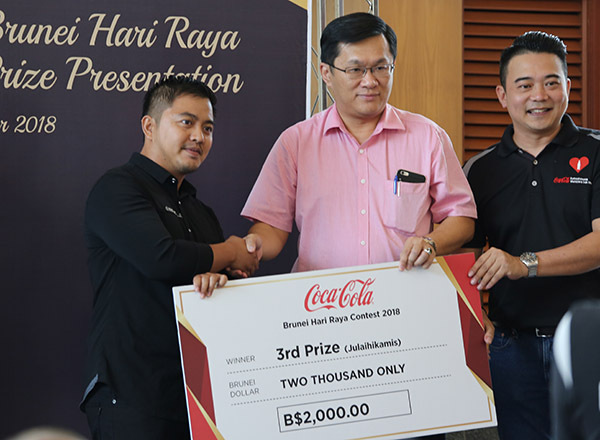 The Coca-Cola Raya Contest was organized by Syarikat Perniagaan Malar Setia, the sole distributor of Coca-Cola products in Brunei Darussalam. 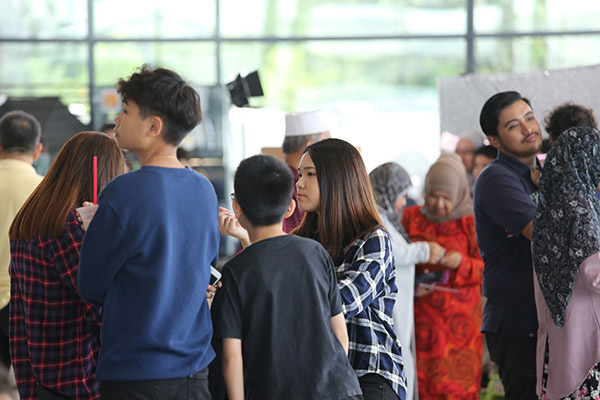 The contest was held in conjunction with the Hari Raya Celebrations from 1st May to 31st July 2018. 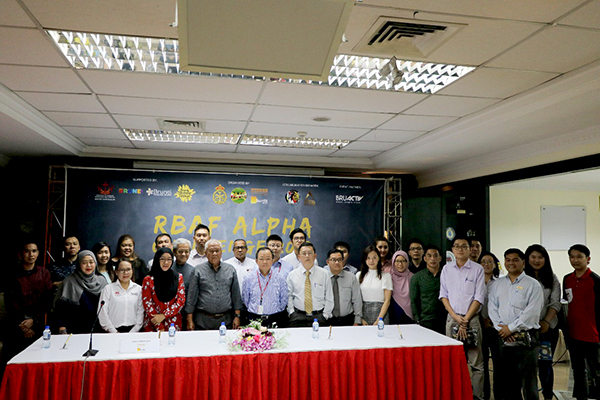 An official partner and sponsor signing ceremony was held yesterday afternoon at D’Sunlit Sdn Bhd premises for the upcoming RBAF Alpha Challenge 2018. 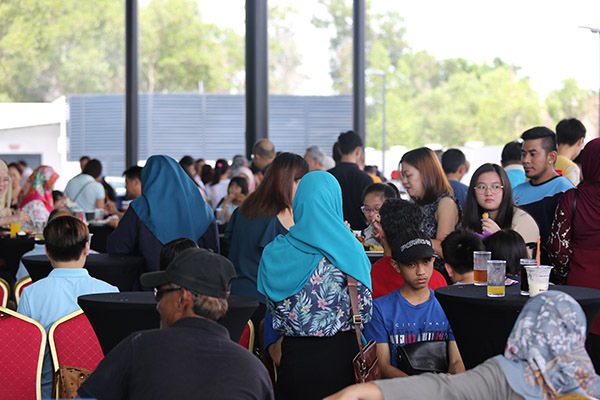 The obstacle challenge will be held in conjunction with the 57th Anniversary of the Royal Brunei Armed Forces (RBAF) where part of the proceeds will be donated to Dana Anak Anak Yatim ABDB. 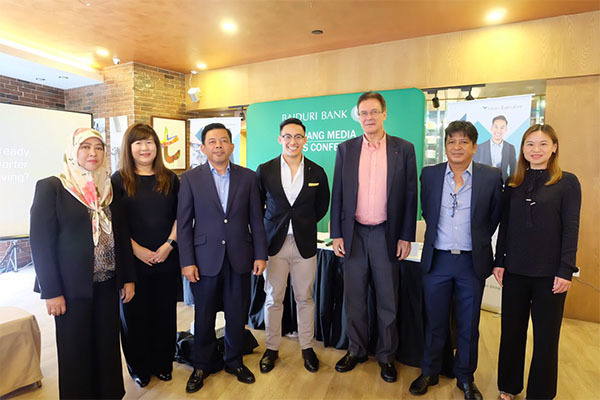 Present during the ceremony were representatives from D’Sunlit Sdn Bhd, Dato Haji Danial Bin Haji Hanafiah, Director of D’Sunlit Sdn Bhd and Mr. Mike Chia, Sales Manager of D’Sunlit Sdn Bhd. Also present during the signing ceremony were the respective event partner and sponsor representatives. 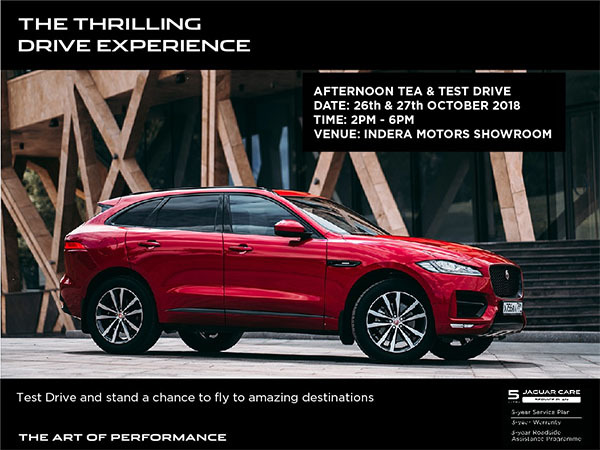 So who are the sponsors and partners of the event? 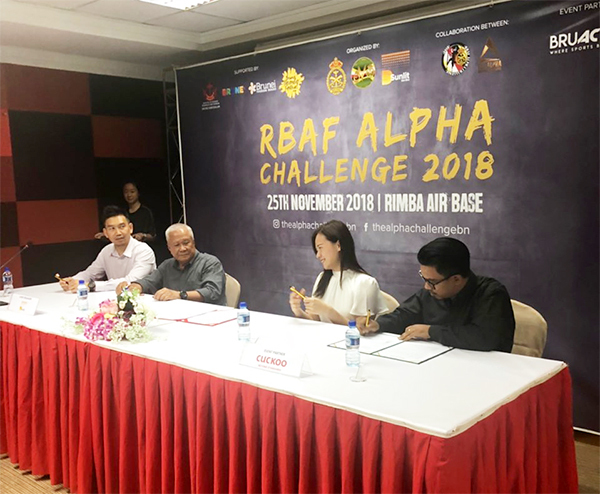 With the collaboration between D’Sunlit Sdn Bhd’s Alpha Obstacle Challenge and the Royal Brunei Armed Forces (RBAF), the RBAF Alpha Challenge 2018 will be presenting a bigger and more exciting obstacle course that will give participants the opportunity to push beyond their limits. 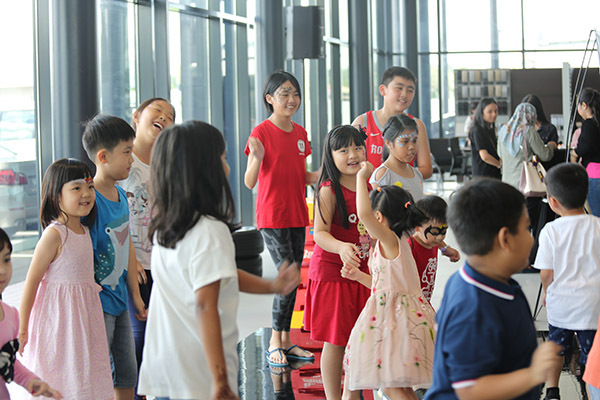 The event urged individuals and teams to conquer all the obstacles through determination, encouragement and teamwork. 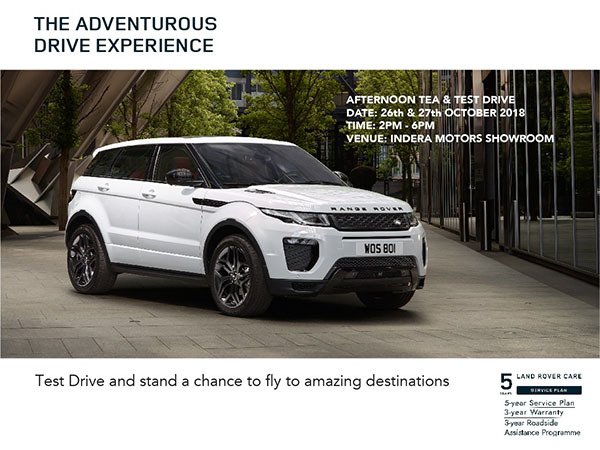 This will give participants the opportunity to test both their mental and physical aspects. There are two (2) categories available for participants to choose from: “Fun Runs” and “Competitive Challenge”. The “Fun Runs” are available in 3km (B$35.00) and 5km (B$45.00) respectively. On the other hand, the Competitive Challenge consists of two criteria: 10km Individual challenge (B$55/ person) and 10km Team Challenge (B$250/ team of 5) with cash prizes to be won and a chance to be tested against the time. 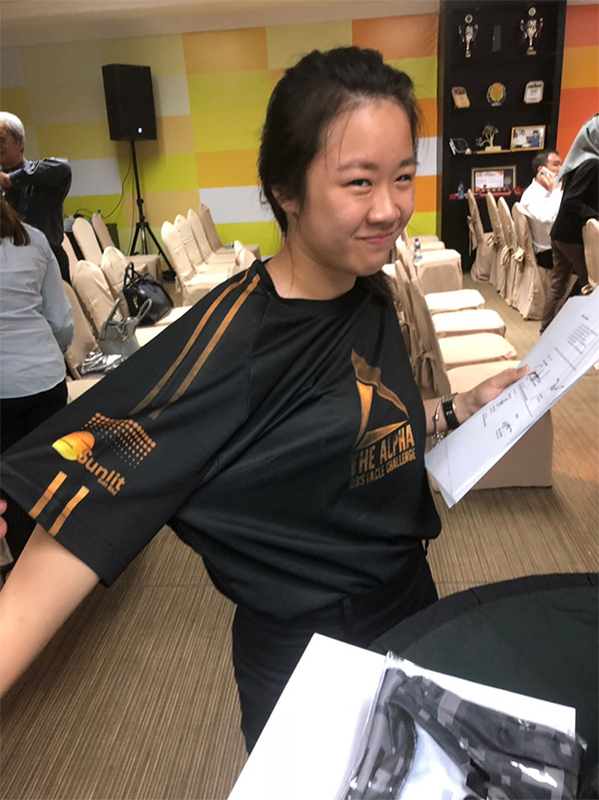 Interested participants may register via online at www.thealphachallengebn.com or register manually at D’Sunlit Sdn Bhd Office (closes everyday at 5pm and 12pm-2pm during Friday prayers) until 11th November 2018. Follow their Facebook page “The Alpha Challenge” and Instagram @thealphachallengebn for more regular updates and we’ll see you at the RBAF ALPHA CHALLENGE 2018! Don’t Quit and Let’s Conquer! 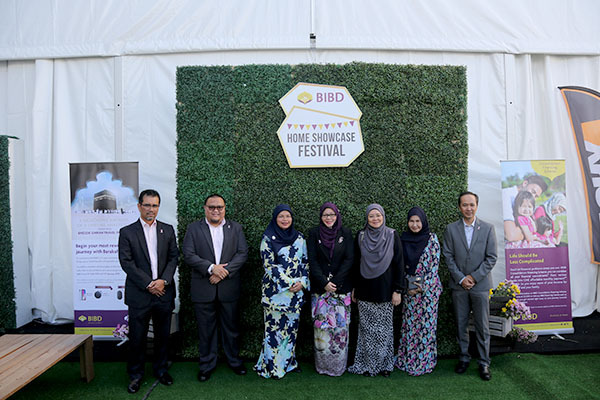 Bank Islam Brunei Darussalam (BIBD) today organized its 13th ‘Home Showcase Festival’ aimed at highlighting the benefits of home ownership and providing a one-stop platform for current and prospective homeowners especially the young ones. 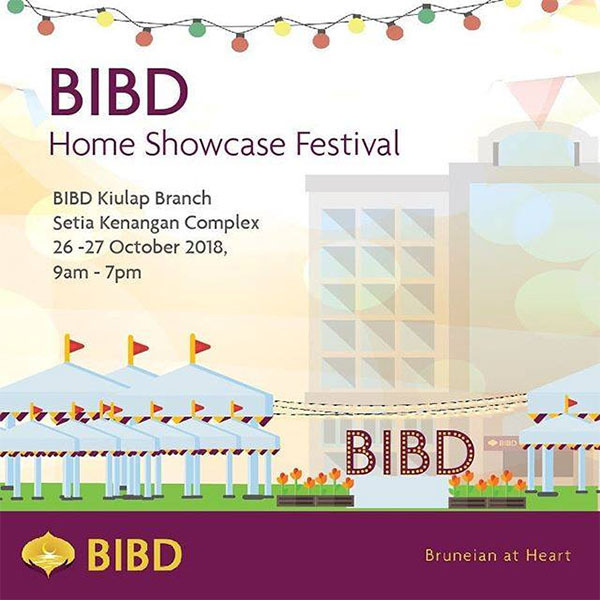 The BIBD Home Showcase Festival will run until Saturday, 27th October 2018, and is open between 9am-7pm. 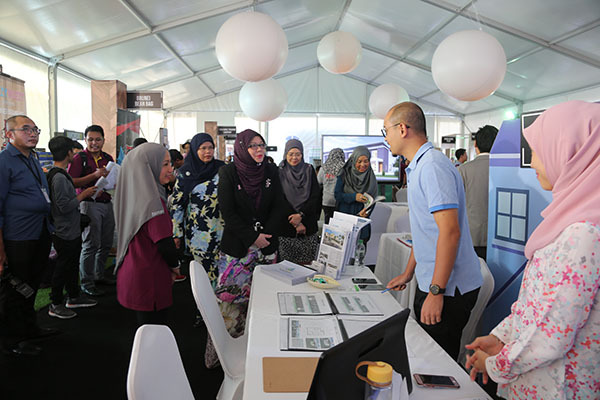 BIBD partnered with realtors and interior designers to showcase their products and services that will complement their search on their future homes. 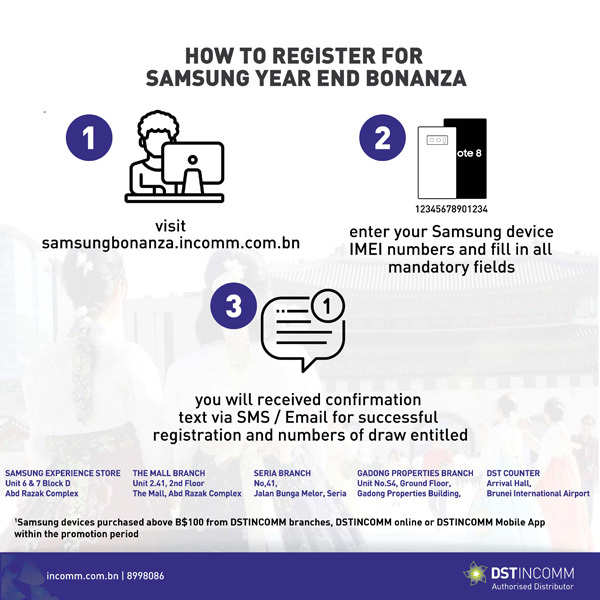 All home financing applications, and other eligible products and services taken up (T&C applies) during the 2-days event will automatically be entered to the BIBD Barakah 8 that offers a B$25,000 Umrah package as its main prize. 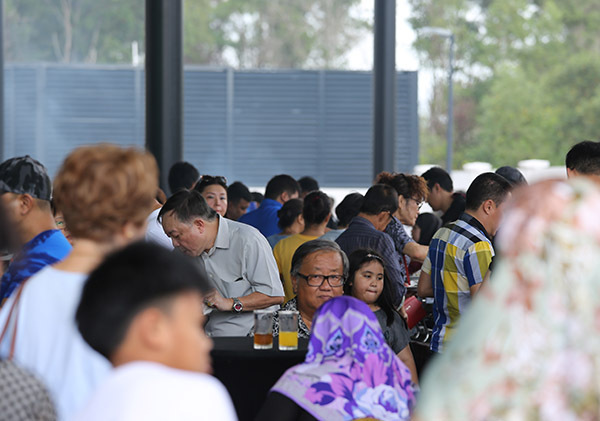 The event also showcased Fabular as its featured event partner who launched their Fabular Village which introduced visitors to affordable and minimalist home opportunities and living lifestyle, the future homes targeting millennials. 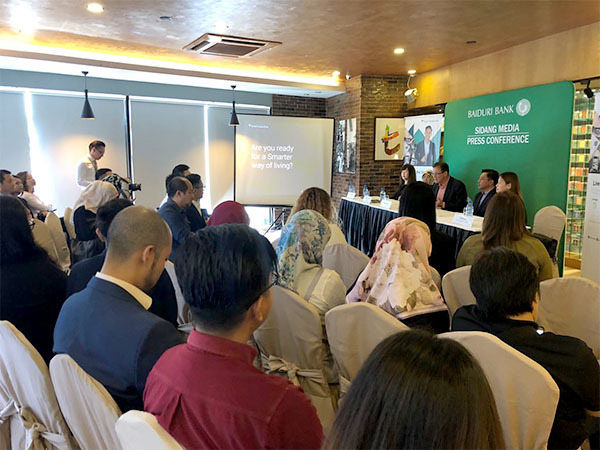 Besides offering special discounted rates and waivers on processing fees, there are also Coffee Bean and Tea Leaf vouchers, and up to 100,000 Hadiah Points for new credit card applications. 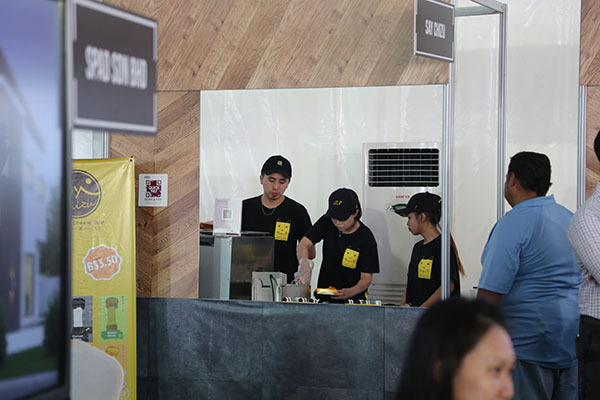 The event also served as an avenue for some 30 local entrepreneurs and SMEs, and this is the first time that some participating vendors will be promoting cashless payments with the BIBD QuickPay, under its BIBD NexGen solutions. 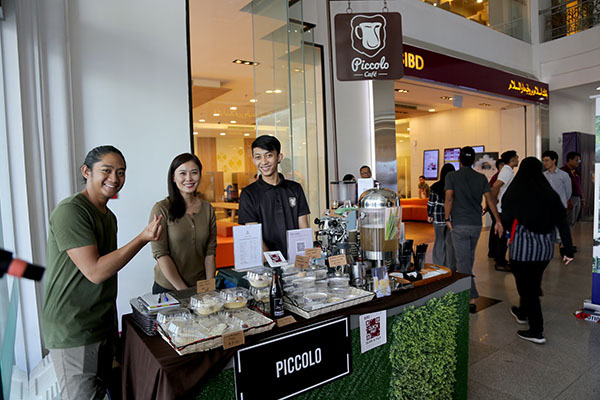 As part of BIBD’s efforts to support the de-cashing of the economy with seamless transactions via mobile-led technologies, services like QuickPay are part of the BIBD NEXGEN platform that caters towards mobility and convenience, aimed to bridge the digital gap between customers and business owners, particularly budding entrepreneurs. 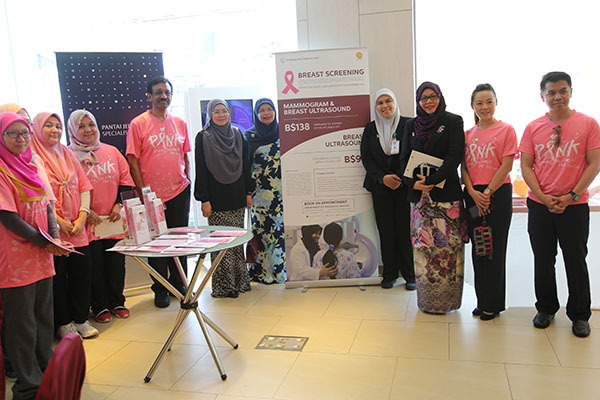 Also brought in to the event is BIBD’s support towards the cause of Breast Cancer Awareness, where the public also had the opportunity to understand more about it from representatives of the Pantai Jerudong Specialist Center (PJSC). 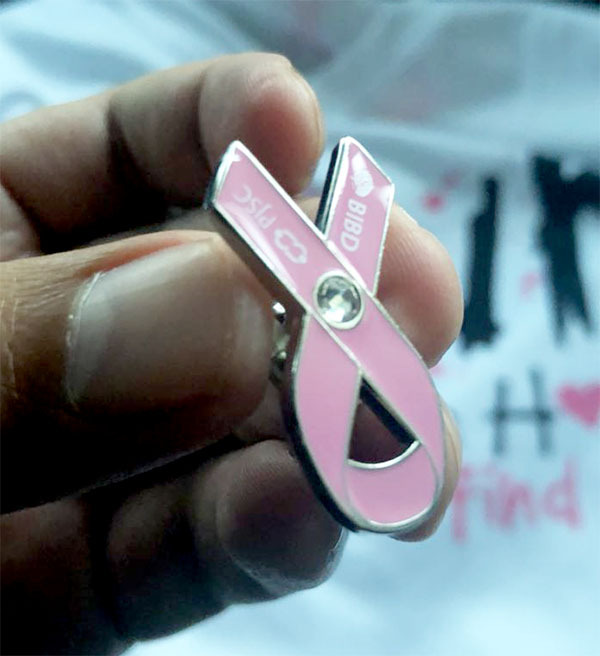 This is part of BIBD’s CSR initiatives to bring awareness to the community and be in touch with the professionals. Present as the guest of honour to officiate the event was Yang Mulia Dayang Dr. Nor Imtihan binti Haji Abdul Razak, Permanent Secretary at the Ministry of Development. Also in attendance during the launch were BIBD senior management and personnel which was held at the BIBD Kiulap Branch. 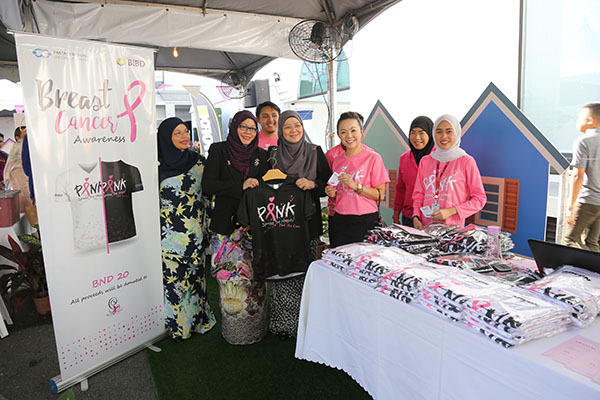 Pantai Jerudong Specialist Centre is selling Breast Cancer Awareness t-shirts and all the proceeds will be donated to Breast Cancer Support Group. I love their pins. My long overdue entry. 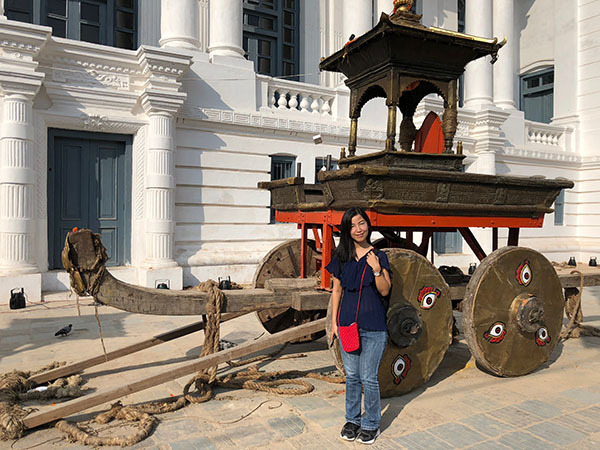 My recent trip to Kathmandu from 25th September to 3rd October was definitely an eye opener and perhaps the best highlight of my travels for 2018 so far. 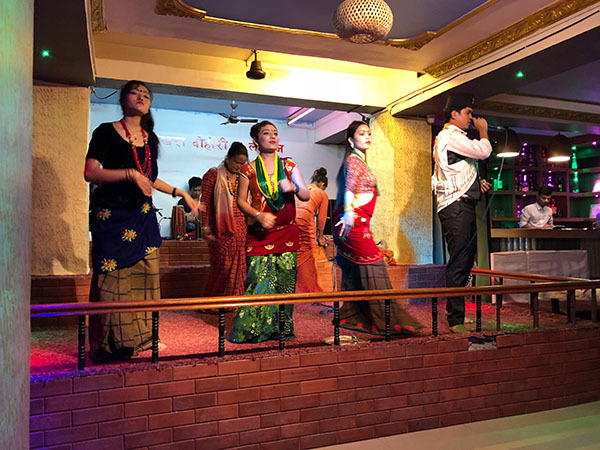 Initially, I was slightly skeptical, feeling a bit fearful, being in a country too foreign and a country recovering for the devastating earthquake back in 2015. I even worry to the point of internet connection (the lack of it) and such (Yea, you can tell that I’m quite addicted to the world of internet). Being a CI holder, meaning a Certificate of Identity “passport” holder, I wasn’t sure if my travel document will be accepted in Nepali waters. 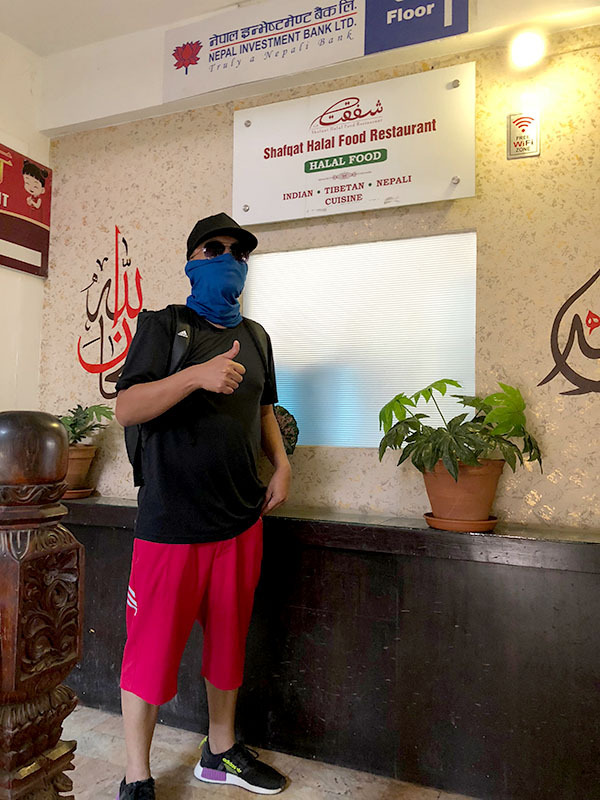 I only knew my fate at the Nepal Embassy in Kuala Lumpur where I waited patiently for 3 hours before my travel document reached the Chargé d’Affaires level as the First Secretary couldn’t give me a definite answer. Finally, it was a YES and I was too excited that I would be able to fly to Kathmandu with ease. So ladies and gentlemen, for those with CI “passport”, it will only take one day to process and you collect your passport the following day. For 15 day visa, it’s RM 100, 30 day visa for RM 160 and 90 day visa for RM 400. 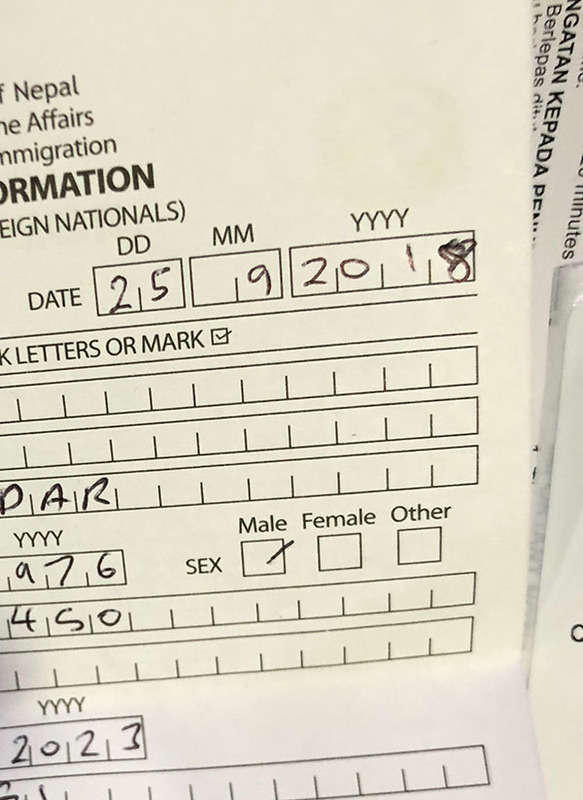 I applied the 15 day visa. For those wondering on catching a flight to Kathmandu, there are many airlines that fly to Kathmandu via Singapore/Kuala Lumpur. 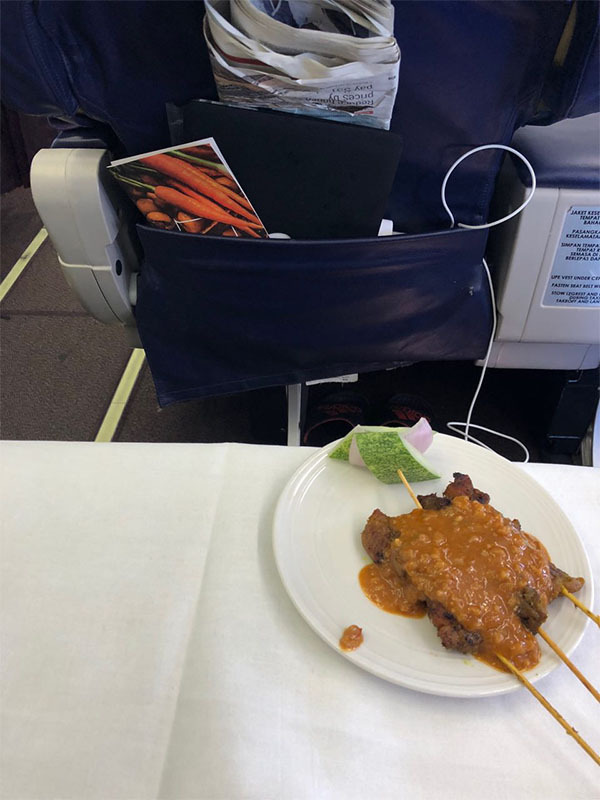 My preference would be through Kuala Lumpur and I believe that one of those legs, you have might have to sacrifice one night in Kuala Lumpur. The average flight fares are at BND 800ish so it’s something for you to plan in advance to save up for the fares. My preference would be taking Malaysian Airlines because of the comfort as compared to AirAsia. The flight from KL to Kathmandu is roughly 4 hours 30 mins. 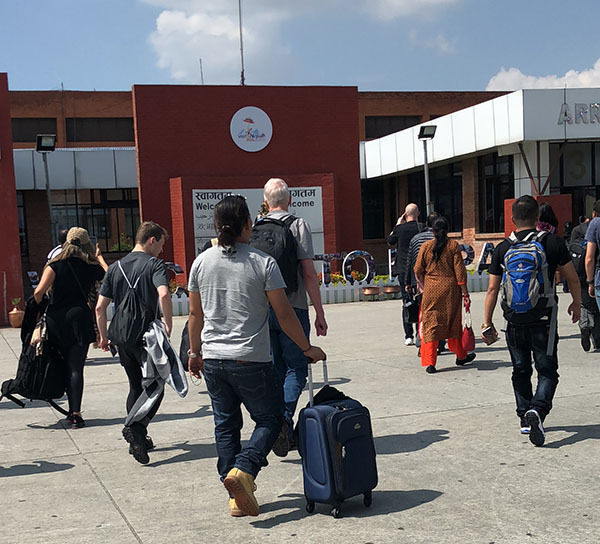 Kathmandu, ah yes, it was surreal when I landed at Tribhuvan International Airport. 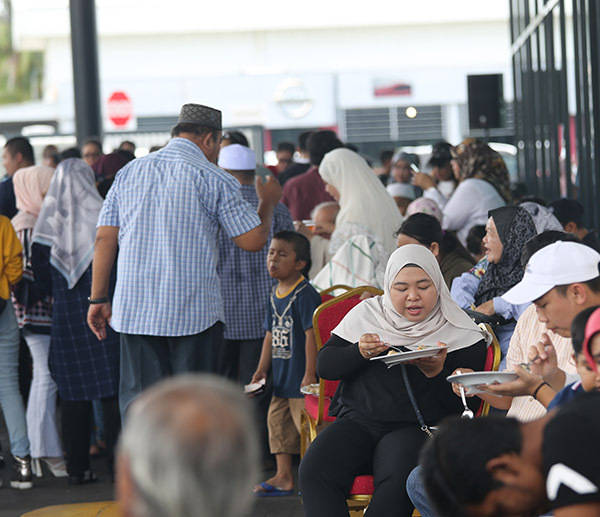 The immigration process was quite efficient and you can actually apply visa on arrival but that would mean longer queue and waiting time. The baggage claim area was pretty small and it can get overwhelming. I was waiting for sometime only to realize that my bag was shifted to the floor from the belt. So do be aware of that. Ohh yeah, do get your SIM card, once you reach the small arrival hall. 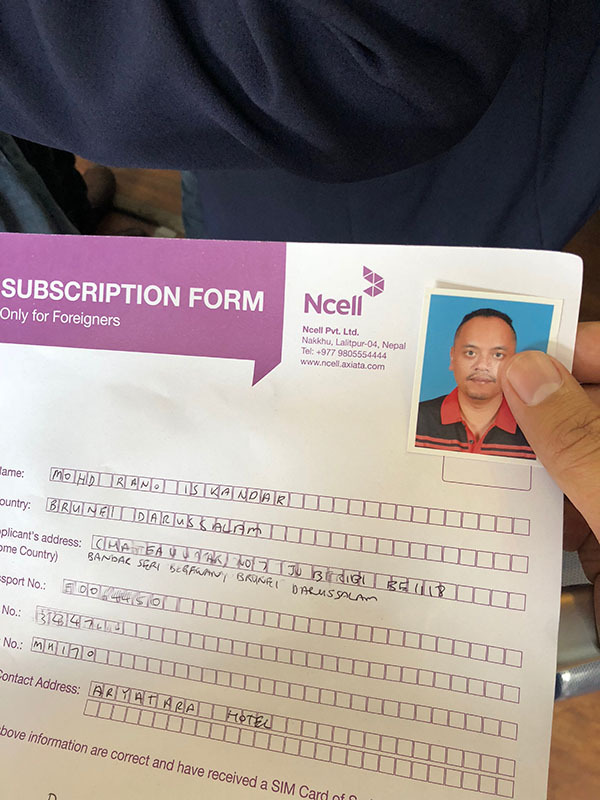 There are only two telcos and I would recommend Ncell. I took the higher tier one with 8GB for around BND 15 which is 1,200 Nepalese Rupee. I was quite impressed that their network is quite fast at times. I also ended up not using the whole data after a week stay in Nepal. There are times when network can be frustrating but overall, I am still impressed with their 4G network. So choose Ncell if you are in Nepal. The only downside is when you apply for the SIM card, you have to fill in a form and also produce a passport size photo. Oh yeah, every subscriber have to fill in a form when you sign up for a SIM card. Good thing I brought my photo. Now Taxis are pretty cheap. They are everywhere once you step out of the small airport. Drivers will be hunting for tourists and for a reasonable price to Thamel (the city area) will be roughly BND 8 (700 Nepalese Rupee). 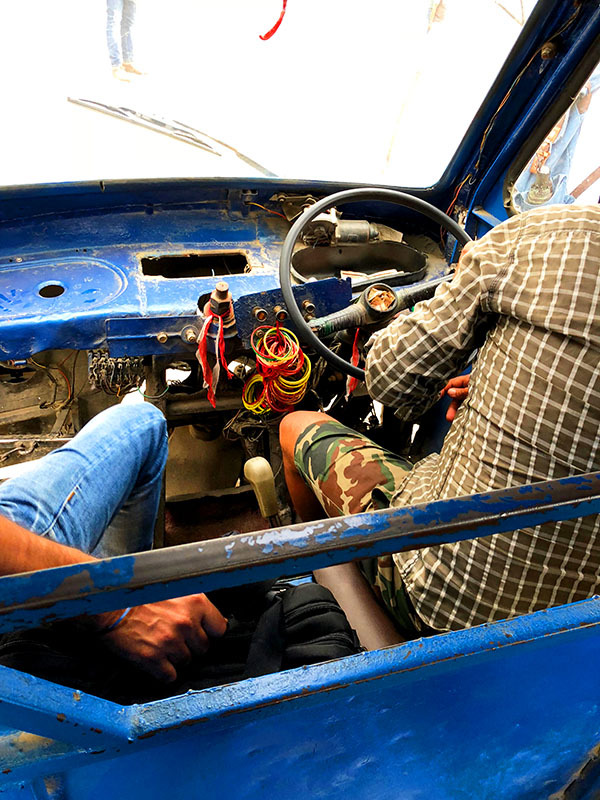 There are no meters on most taxis so you can start bargaining with the drivers. So try to negotiate to 700 NR and if they question you, just say that’s what you paid for on your last visit. The airport to Thamel area wasn’t that far. Even with traffic, it would take tops 40 mins or so. Kinda nearby if you ask me. Hotels. Well, there are pretty cheap and affordable. I chose a 3 star hotel and a 4 star hotel and both were pretty good. Of course, the latter was better. 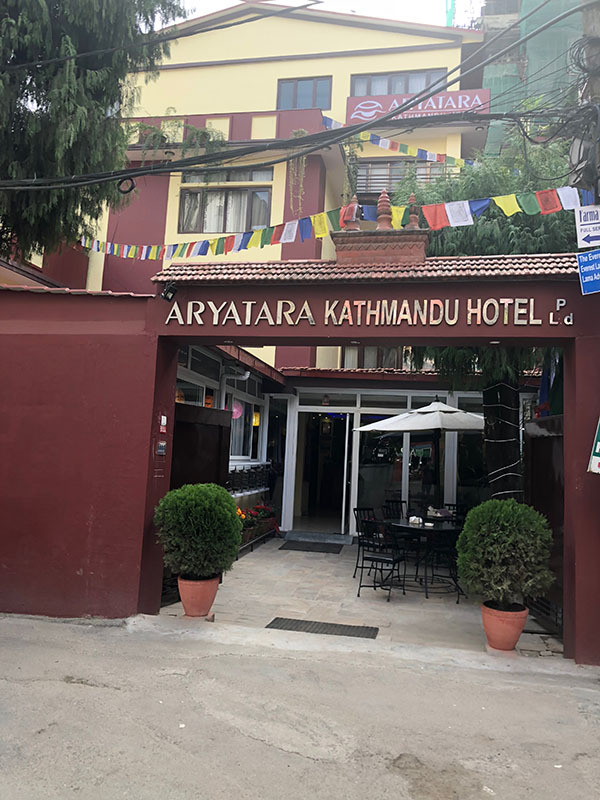 The first hotel I chose was Aryatara Kathmandu Hotel (3 stars) and it’s only around BND 60 per night. It could have been cheaper depending which dates you are flying in. There are even some hotels with great ratings as low as BND 30 per night. So it’s the choices are up to you. I made all my bookings on booking.com and so far, no complains. As for the second hotel I stayed was the Royal Penguin Boutique Hotel which was more of a pleasant stay. Let’s talk about Aryatara Hotel. I love the service. The front desk people are quite polite and even the manager on duty. He took time to greet those who dined in for breakfast and I thought that was a nice gesture to have. My room was quite spacious and the bed was not bad. I had a spare twin bed where I dumped my other things for convenience. The hotel has good access to the market area too. Breakfast wise, it wasn’t too bad, it wasn’t too good. Just average because of its limited choices. TV channels are limited. Then again BND 60 is a great deal. Ain’t complaining. You can have airport transfer from the hotel too. There’s a Korean restaurant next to Aryatara. As for laundry, there’s a laundry outlet nearby and they go by the kilo. 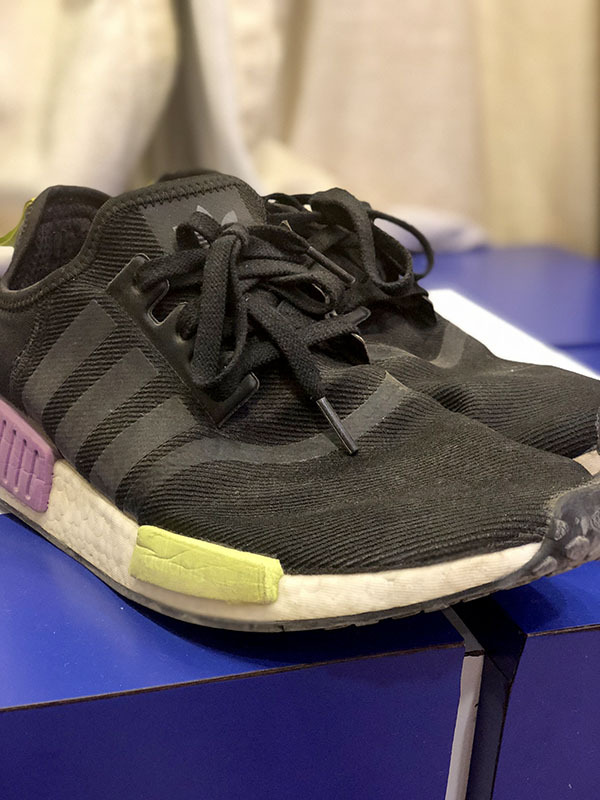 Quite cheap too. As for Royal Penguin Boutique Hotel, I am in love with this hotel. For BND 100 per night, I didn’t expect such good service and furthermore, the room was pretty awesome!! 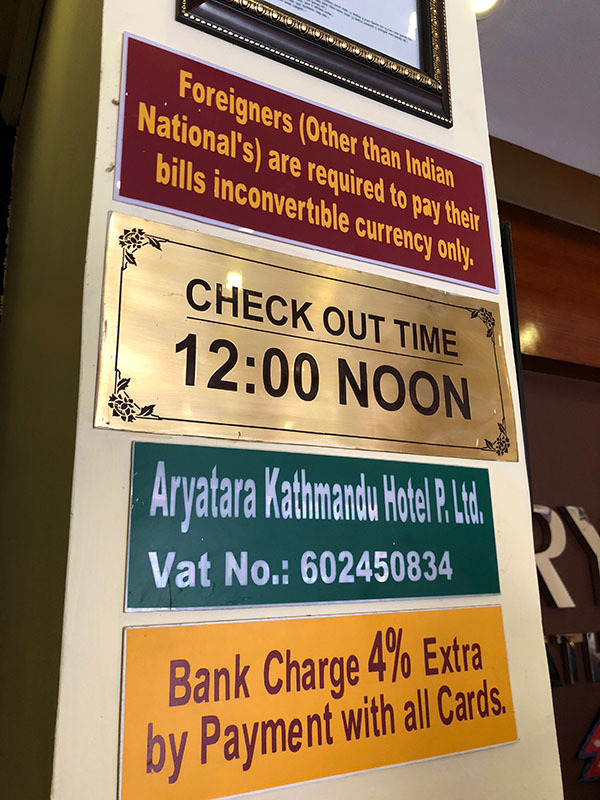 I didn’t expect this in Nepal and according to my friend who works at Agoda, this is one of the top hotels in Thamel, Kathmandu. The service is top-notch and they treat guest like god. 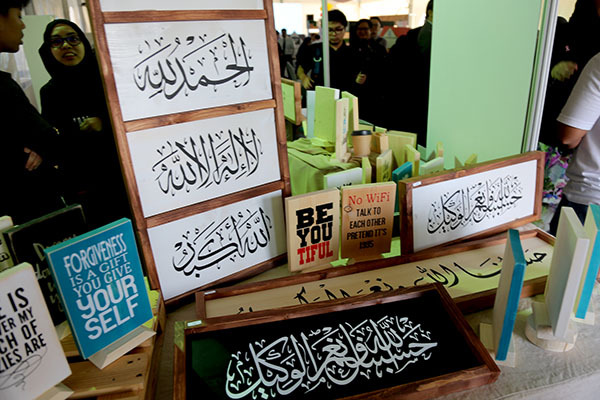 What I am impressed with the designs of the room. So much thought being invested in RP rooms. 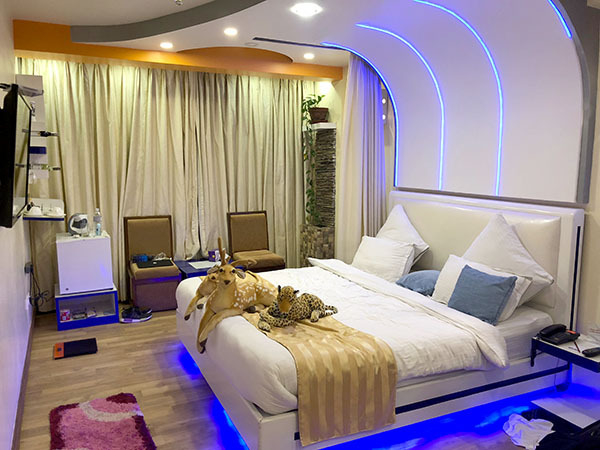 It has even stuff animals and fresh plants inside the room. The TV channels are endless. I could just stay in and watch TV all day long. Even Premier League matches are available. The room service is 24 hours too. The unique thing is the breakfast deal. Since it’s a set breakfast, you can have it anytime of the day and not only limited to breakfast hours. Cool, huh? The only beef I had was the wifi. My Ncell 4G line is much faster than the in-house wifi. Other than that, it’s great. A safe box, a weighing scale and even provided an extension with multiple sockets. Clean and modern looking, I would guarantee you that you will enjoy your stay at Royal Penguin and it’s located at the smackdown area of Thamel city. I shall visit this hotel again on my next trip. I was in love with Royal Penguin Boutique Hotel for so many reasons. Highly recommended. The good thing is that you pay in your preferred currency though they don’t accept Brunei notes. I had my Singapore dollars then. US dollars is also widely accepted. 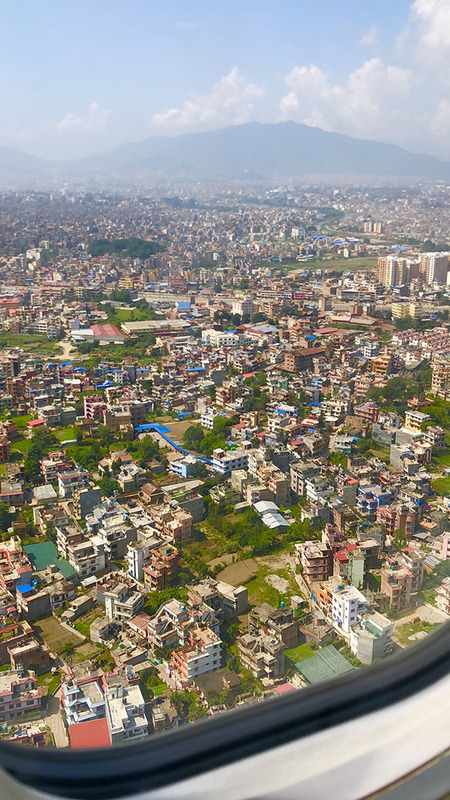 Kathmandu. Now this is one interesting city. 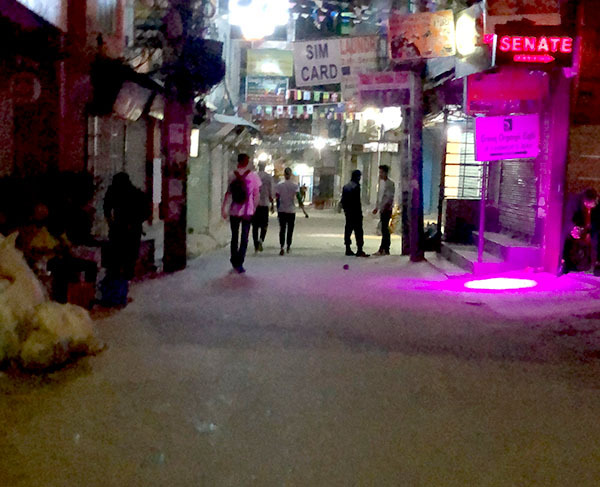 Despite the hustle and bustle of Thamel, I felt a sense of calm and it took me a few days to get warmed up. 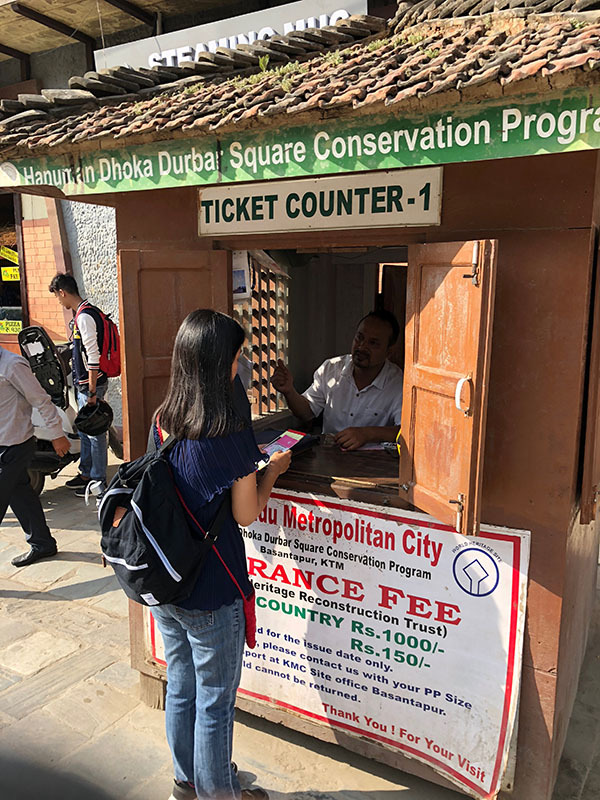 Of course, my travel buddy, Pranika Lama, guided me on tips and such for me to be familiar around the city from walking to grabbing a “tempo” to a taxi. I even had an opportunity to hop on the public bus. Google maps was also my saviour. The only one that I didn’t experience was hoping on a van. Apparently the van ride was much more risky as compared to the rest according to Pranika. The “Tempo” was an interesting ride. It costs roughly 10-20 cents only. 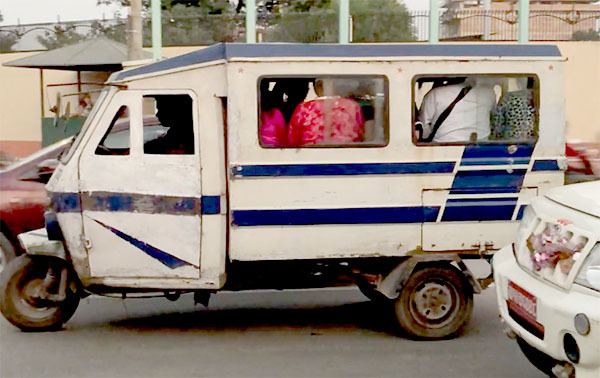 It’s like their version of Tuk Tuk but bigger. It’s shared for the public and you can hop on anytime you want and just pay the driver the fee after being dropped off. I was wondering the mechanics of the Tempo but it was pretty simplified. It was able to carry at least 10-12 people, depending on your sizes. When you think it’s full, don’t be surprised if one or two person can still squeeze in. To cue the driver for the next stop, just simply use ur hand to bang on the metal roof. The cheapest means of transport but the only problem was the language barrier if you want to ask the driver for directions. I was fortunate enough to have Pranika guided me on which number Tempo to hop on. The Tempo I was talking about. It’s operated on batteries and not petrol. You can see the skeleton of the Tempo at the driver area. I can even notice the ground from this view. After my 3rd day in Thamel, my love for Nepal grew and I became more adaptive to the environment. 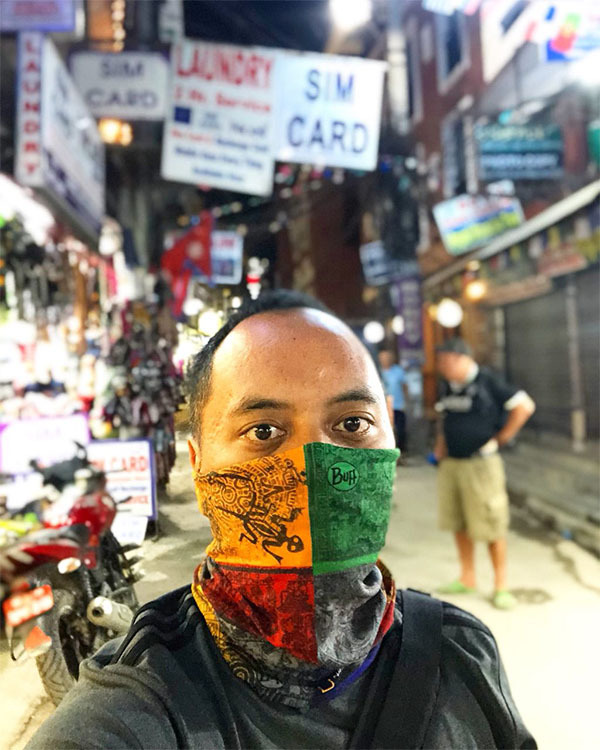 Yea, you may have noticed me sporting a face mask and that was because Thamel can be very dusty as constructions were still ongoing for the restorations of building and temples after the 2015 earthquake. 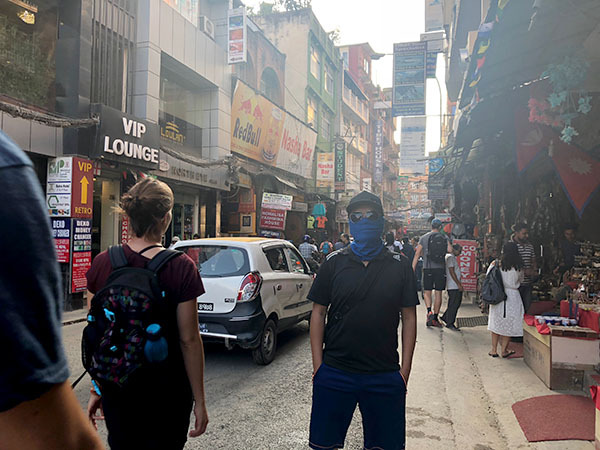 So yea, my advice is to buy a mask, just in case and it is also a good fashion accessory 😉 Walking 3-5 kilometers was my daily routine and Thamel was such a crowded zone with tons of shops, selling handicrafts, boutiques, clothes and even electronics. I did spent a handful on clothes for souvenirs and plenty more on accessories. I ended flying back with a 35 kilo load which was an unusual practice when I travel abroad. 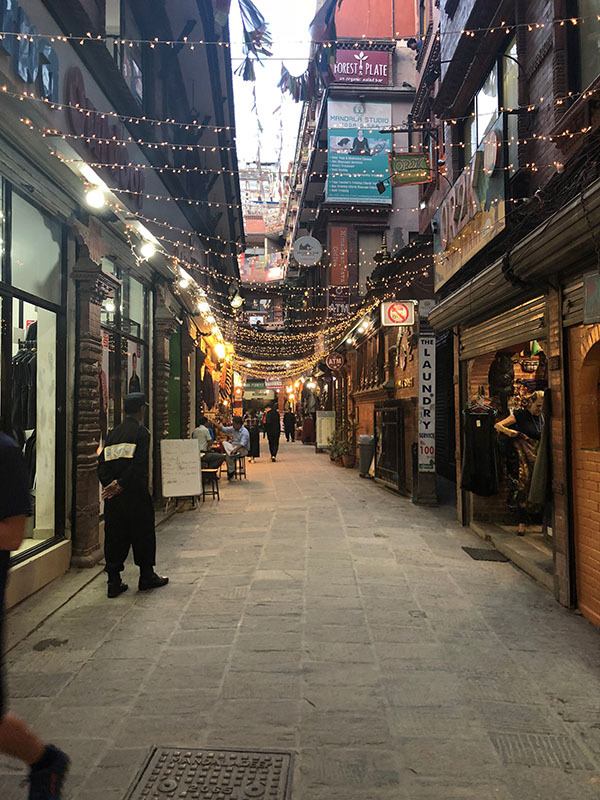 Halal restaurants were easy to locate and I believe they have roughly 5-6 within Thamel. You can simply google Thamel Halal. I tried Shafqat Halal Food Restaurant, Anatolia Restaurant (Turkish and Indian cuisine) and Third Eye Restaurant, maybe favourite of the lot. Please do try the Nepalese dish – Momo and Dal Bhat. Dal bhat is a traditional meal from the Indian subcontinent, popular in many areas of Nepal, Bangladesh and India. 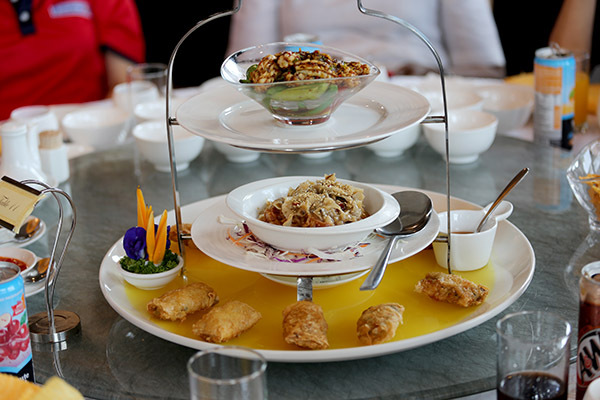 It consists of steamed rice and a cooked lentil soup called dal. I actually enjoyed the dish but it can be very filling for me. Momos, according to Pranika, aren’t as authentic as they added more flavor which loses the authenticity of the taste of a real Momo. Well, if you are keen, you can try out a Momo restaurant in Kuala Belait where the Momos are cooked in a traditional way. Just another advice if you are in Kathmandu, do order water bottles rather than a glass of water. Sometimes, you don’t want to take the risk of not acclimatizing to the boiled water in Kathmandu. So to be safe, order water bottles instead. One of the halal restaurants I tried at Thamel. Culture. Interestingly enough, this is a city that has high tolerance on religion. Both Hindu and Buddhism are very common and when you visit the temples and Stupas, most of them will share histories of their gods. 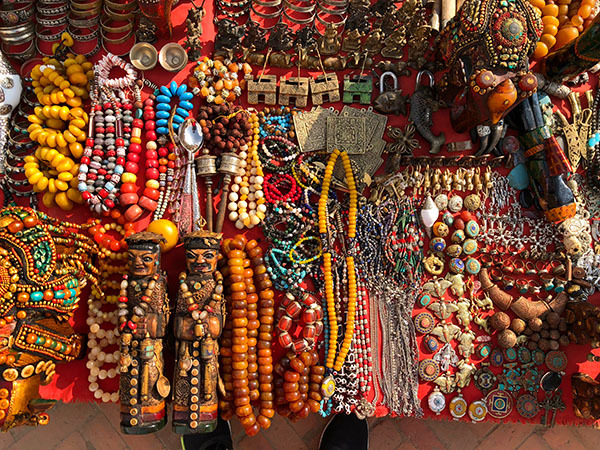 It was no surprise that there are tons of arts and sculptures in the Kathmandu valley. 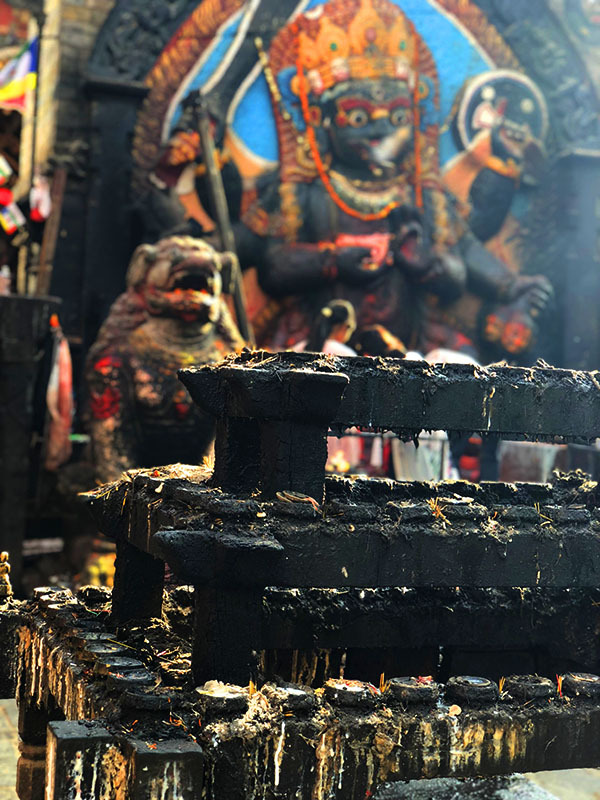 If you are into history, there is an abundant of historical sources in Kathmandu. You can visit the museums, temples and so on. 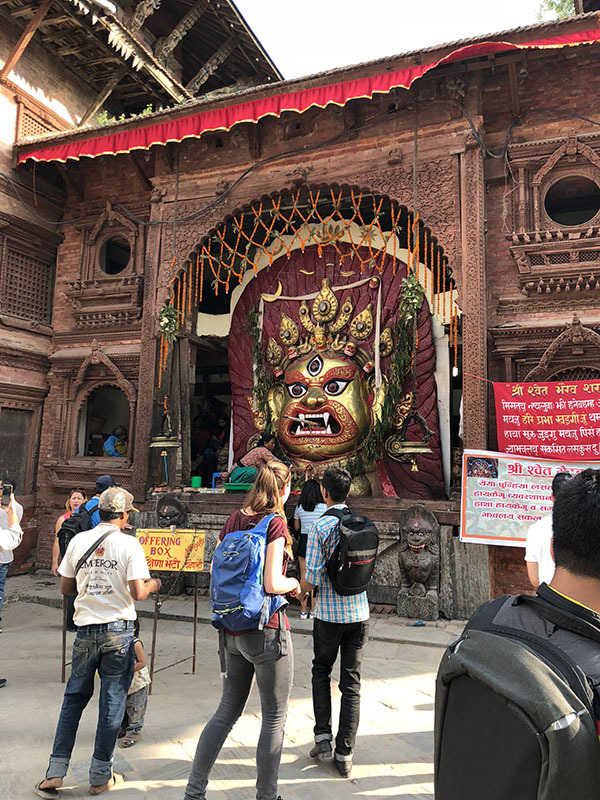 Of course, the popular ones which made a name of itself were Durbar Square, Pashupatinath Temple and along the streets of Thamel because Dr. Strage was being filmed there. 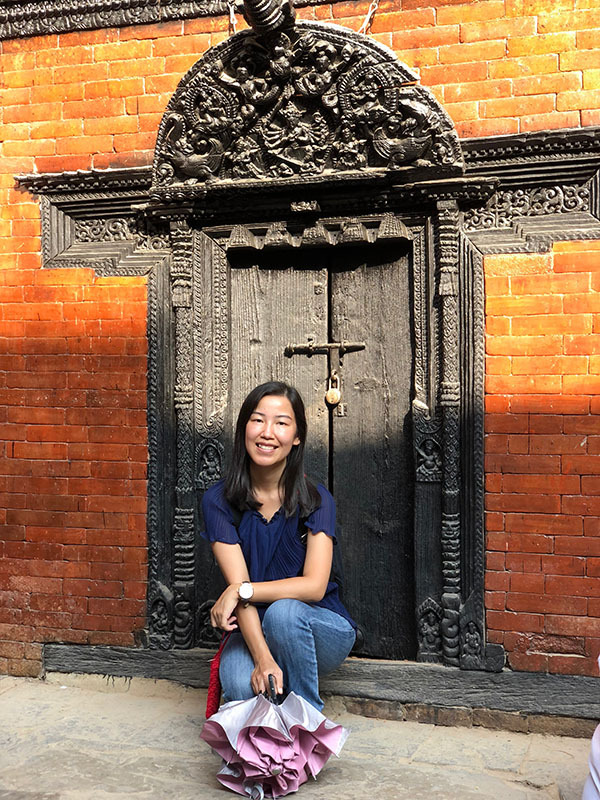 I only managed to enter Durbar Square and took some shots and of course, Thamel street is also quite accessible and convenient to visit. Human traffic is quite high especially at the tourist zone with a mixture of foreigns and locals. Even on narrow streets, all types of vehicles can still drive thru the congestion and there were times when they can get stuck for a little while. Some cars would even step on the gas in tighter streets. The usage of horns were quite high and it was pretty common. One of my Nepali friends told me that one of the highest cause of death were accidents. Ironically, I only came across one accident, on the final day of my stay in Nepal. I would have to say that on average, the Nepalese people are quite hardworking in earning a living. There were even little children, carrying huge sacks on their back to deliver items to his/her clients. Dusty. I remembered two years ago when Pranika was wearing her face mask because the air pollution was quite moderate. 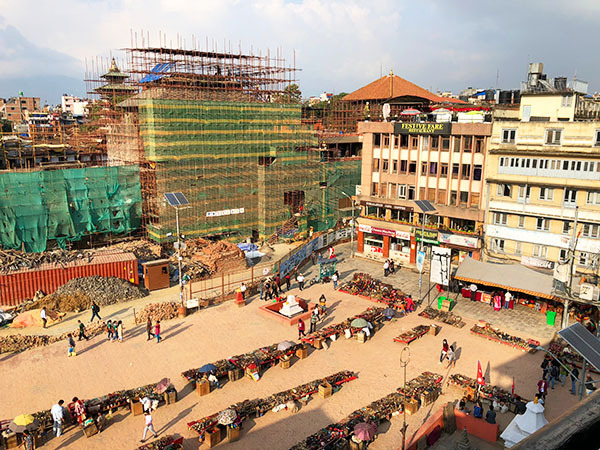 Most of the areas in Thamel were dusty due to the ongoing constructions and restoring of roads and buildings. I masked myself almost 80% of the time as I could sense the dust. 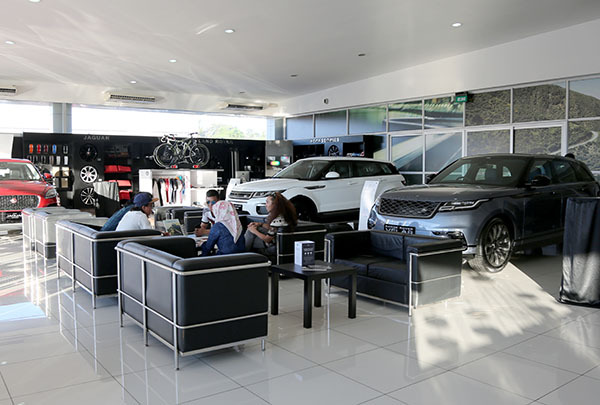 You will see shop attendants planting water to the flooring area outside their shops so the dusts will settle down when people walking or cars driving past. When shops closed after business hours, some would clear off the dust and sand from their products that were displayed outside the shop. Be mentally prepared for these kind of situations. Stay tune for my second part!! This is the mood after 9pm. Most shops will be closed by then. 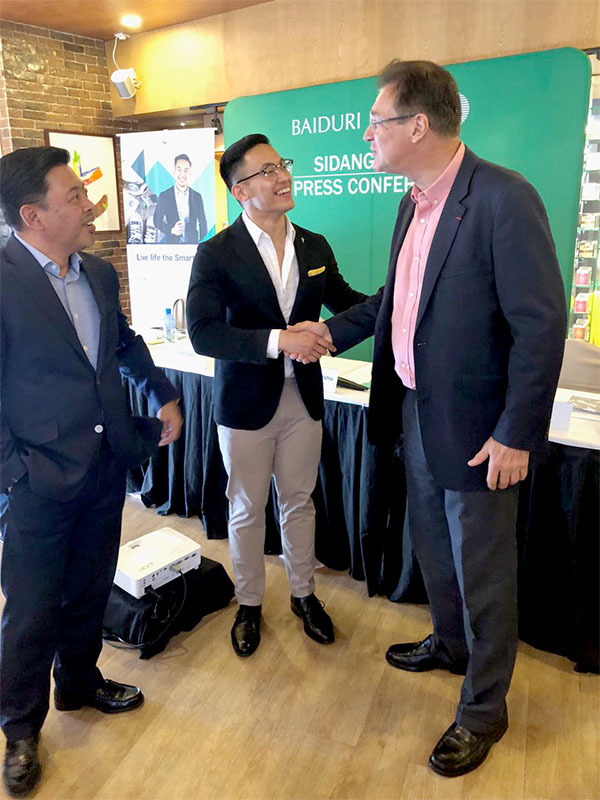 Baiduri Bank launched its revamped Baiduri Smart Executive Programme (SEP) last week, a programme targeting the young and busy executive. 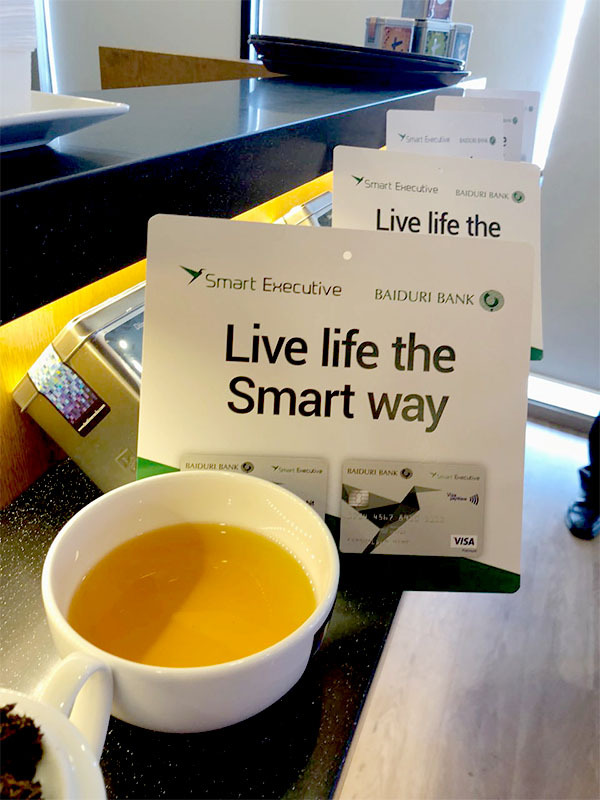 The new Baiduri Smart Executive Programme offers more benefits tailored to meet the financial and lifestyle needs of young professionals ranging from banking convenience to financial flexibility and tools.